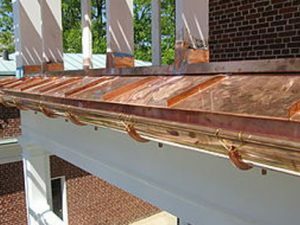 Few companies offering gutter installation in Baltimore or nearby cities in Maryland can match the combination of products and service provided by Roland Slate Service Company. We pride ourselves on offering the highest level of craftsmanship, and all of our products are installed by our own highly trained employees. As a family-operated business, we provide the personalized gutter installation service that you deserve and your chosen product that will fit your needs and your budget. We also offer gutter guards. These exceptional products are designed to prevent clogs caused by the buildup of leaves and other airborne debris in your gutters and ensure that your gutter system channels water as efficiently as possible. Adding premium gutter guards to your existing or new gutter system also means you will never have to spend time cleaning out your gutters again. Contact Roland Slate Service today and schedule a free consultation at your home or business in Baltimore, MD, or a nearby city. Don’t forget to ask about our very attractive financing options for gutter installation.